This wonderful and charming flower fell out of grace with gardeners for many many years and it is only in the last couple of years that it is creeping back into the gardens of the chic and knowledgeable. 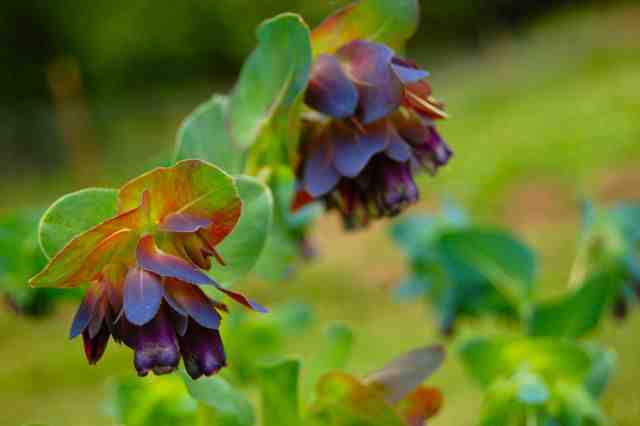 She has large, glaucous greeny-blue leaves, becoming progressively bluer as they rocket up the stem, and terminating in a thick cluster of deep blue bracts with a deep purple hood with a white center. If Cerinthe major were a novel she would be a Gothic masterpiece… probably involving vampires and innocent young ladies.